Kia Orana, Rarotonga is a popular island holiday destination for Kiwis and has an impressive tourism infrastructure for an island of its size. At 32km in circumference it's relatively small, and you can drive the flat, coastal road in around 45 minutes. A reef encircles the island and in parts the water is clear, the sand golden and the fish life colourful. 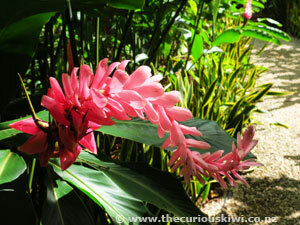 The climate is tropical and the average temperature is around 24°C. (Cyclone season runs November - April but cyclones aren't frequent visitors and arrive with prior warning). 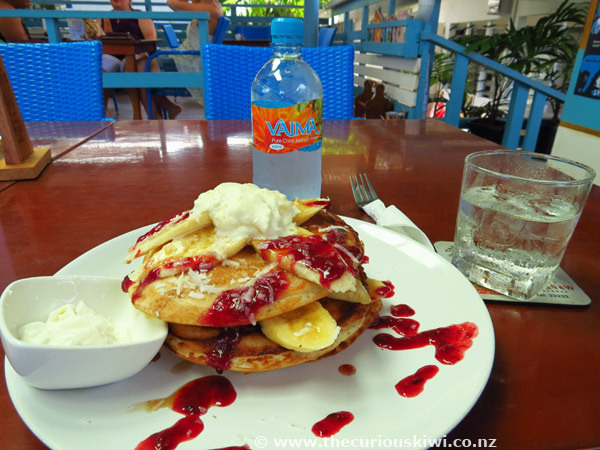 The island has accommodation to suit a backpacker budget and beyond, self contained rental accommodation is plentiful and there are good quality resorts and luxury villas. Scooters (new helmet laws and licence requirements apply) are popular transport for locals and visitors and there are plenty of reasonably priced scooter and car hire options. There are also public buses that circle the island in both directions. Food and drink can be expensive as a lot of it is imported (see Food & Dining for price examples), however we dined out for most of our meals and prices were similar to what we would pay in NZ. 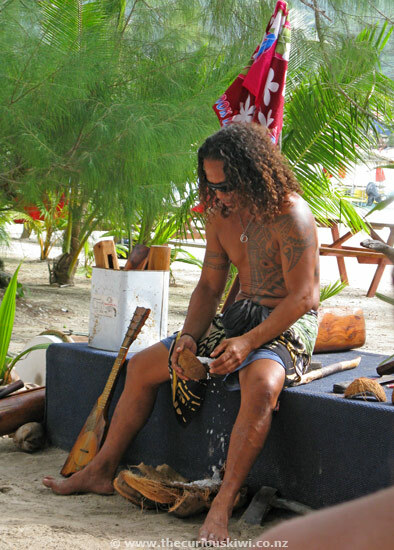 Language: Cook Islands Maori (15 dialects spoken over the 15 islands that make up the Cook Islands), English is widely spoken. Cook Islands Maori Dictionary. 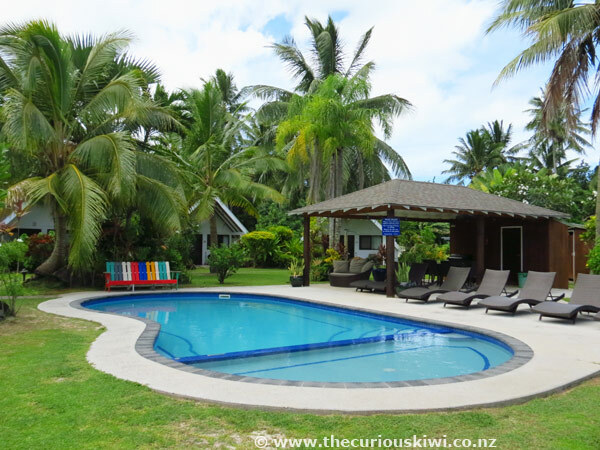 Population: Approximately 13,044 on Rarotonga, total population 17,459 (2016 Census information). Currency: New Zealand dollar along with Cook Islands coins - $1, $2, and $5 dollars, and 5, 10, 20 and 50 cent coins. 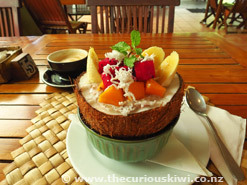 Official Tourism website: www.cookislands.travel. 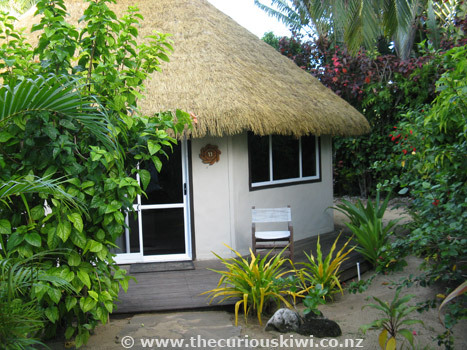 The Visitor Information Centre is in Avarua next to ANZ Bank. Transport: Public buses, scooters, cars and bicycles - pedal and electric. There are taxis but they don't drive around looking for fares, you need to call them. Raro Tours provide airport transfers, a lot of accommodation providers will also offer airport transfers (around $15pp one way). 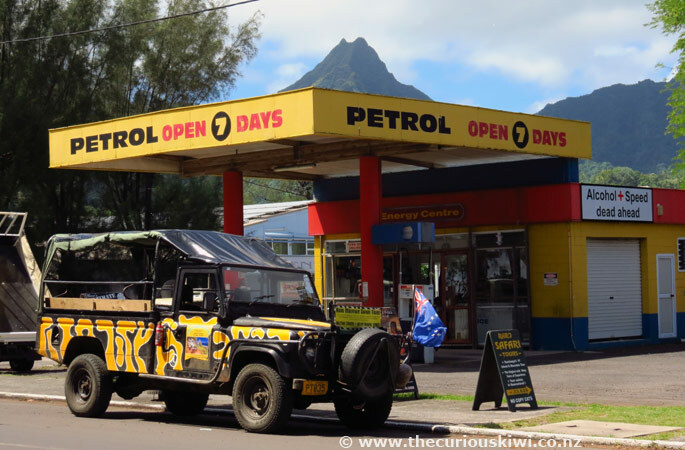 Licence to drive: Cars - Visitors from Australia, NZ, US, Canada, UK and the EU can drive cars using their own licence, there is no need to get a Cook Islands licence. 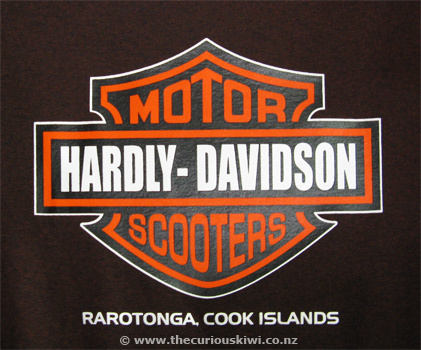 Scooters - If you want to hire a scooter and don't have a full motorcycle licence you need to get a visitors motorcycle licence - see Important - Please Read via Adventure Cooks Islands scooter hire. Rarotonga International Airport: The airport is 3 kms from Avarua. 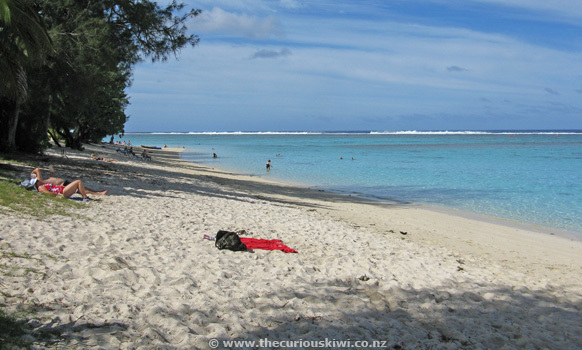 Air Rarotonga provides domestic flights. Air New Zealand, Virgin Australia and Jet Star fly from NZ. There is an Air New Zealand International Lounge at the airport, when we checked in there was a sign saying the lounge was for members only, so as a plus one I lucked out, but you can always ask. Banks: ANZ, Bank of South Pacific and Bank of the Cook Islands. There are a number of ATMs on the island. Sunday: Sunday is dedicated to church, family and rest. Bars and eating establishments may be closed. Prepaid mobile - A visitor SIM card from Bluesky is $49. Alternatively buy a local SIM card for $25 which is loaded with $20 credit. (Bluesky have offices at the airport and next to Avis in Avarua). Water: If in doubt, boil the tap water. Bottled water is sold in village shops, and supermarkets. The local water is Vaima and it can be delivered to your accommodation. 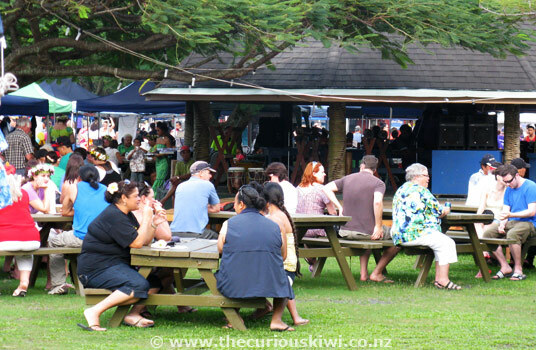 Festivals and Events: Cook Islands Events Calendar. Whale watching: July - October, A where, when and how to guide. What to wear? Casual dress is the way to go, although if you intend to go to church pack something smart. Cover up when you're at the market, in town or in villages. 24 hour, 7 day a week fuel & food: Oasis Energy in Nikao (west of Avarua, near the airport) and Super Brown in Tupapa (east of Avarua). Mosquitoes / Travel Warnings: I'm a mosquito beacon but they weren't an issue in the coastal area, although I may have been lucky. It's best to go prepared, if you explore the island's mountainous interior you'll definitely need repellent. Visit Safe Travel to see if there are any travel or health related warnings for the Cook Islands. 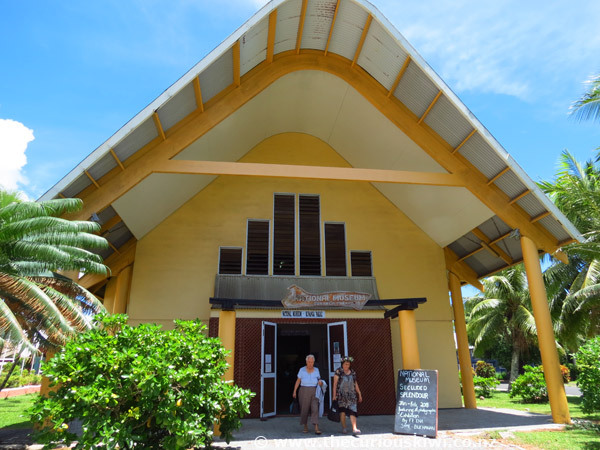 Avarua is Rarotonga's small town centre and has the usual facilities like banks, Foodland for groceries, souvenir shops, CITC pharmacy, cafes, bars and Empire Movie Theatre. You'll also find the Police Station where you need to go if you don't have a full motorcycle licence but would like to hire a scooter. Avarua is a lovely little town centre - it's clean, it's not too busy, there are no $2 type shops, and it's a hassle free place to visit, as is the whole island of Rarotonga. Early on Saturday morning Punanga Nui Market opens to sell local food and produce, and local art / craft work. 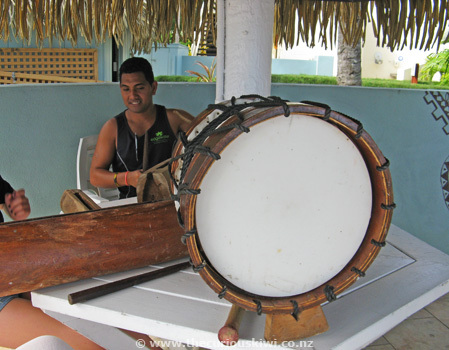 You can buy souvenirs like colourful bags, Cook Islands Pate (drums), t-shirts and pareu (sarongs). 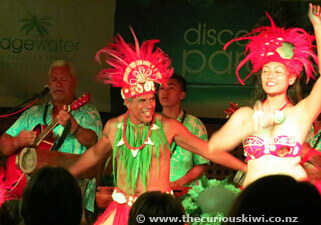 It's likely you'll also see Te Korero Maori Cultural Dance Group perform. A number of tourist operators will be at the market so it's also a chance to find out more about what's offered on the island. The market is definitely worth visiting, there are some stalls open during the week, but Saturday is THE day to visit, it's best to get there before 12 noon. 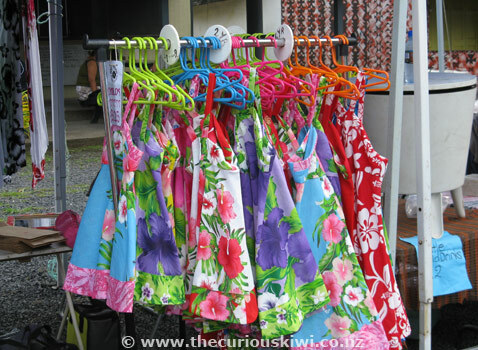 A SPCA Op Shop is at Punanga Nui Market and donations of items to sell are welcomed. On Saturday mornings you may also meet some of the dogs looking for new homes. 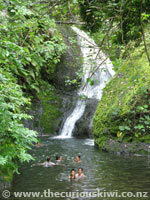 The Cook Islands SPCA is on the road to Papua (Wigmore's) Waterfall and is open to the public between 9am - 11am. There is a Givealittle page for donations, and there is also a SPCA donation box in the departure area of the airport. 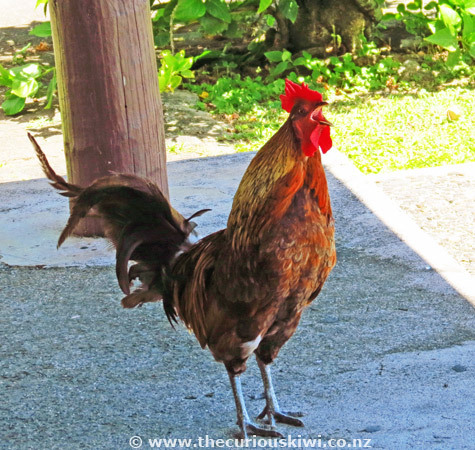 Other groups looking after the animals in the Cook Islands are the recently opened Te Are Manu Veterinary Clinic and The Esther Honey Foundation, although the future of Esther Honey is uncertain given their clinic has closed. Bounty Bookshop stocks guide books, magazines, fiction and non fiction, and some recipe books if you'd like to recreate local dishes at home. 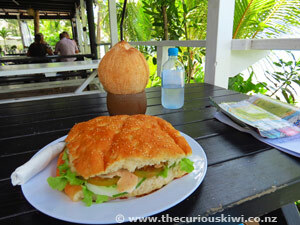 It also sells the Cook Islands News (published daily, $2), and The Cook Islands Herald (published weekly). 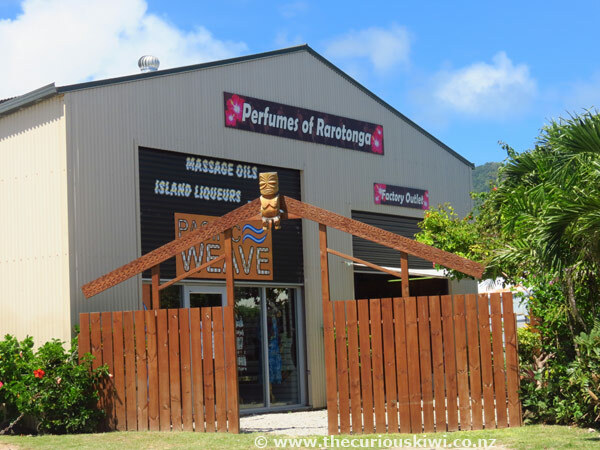 If you're travelling by bus around the island the main bus stop is at Cooks Corner, outside Perfumes of Rarotonga. (See Getting Around below for bus costs and timetable). There is an ANZ ATM machine at Cooks Corner and if you go through the courtyard you will find public toilets. There are also public toilets in the green building opposite the Police Station, although twice I checked them during the day and they were locked. There are library books for sale and the library also welcomes donations of books. The small museum has a $5 entry fee, note that photos and video recordings are not allowed. 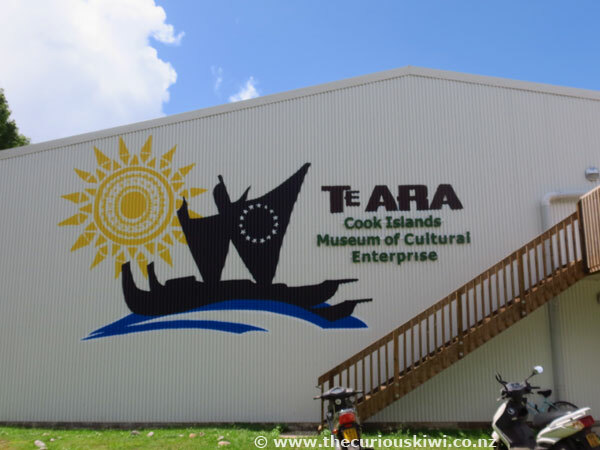 Displays include old photos and paintings, a big shell collection, a time-line of significant events in Cook Islands history, and an exhibition about RMS Maitai which ran aground in Avarua harbour. There are also musical instruments, the museum could do with another wind instrument - aka a fan, it was hot in there. Royalists might be interested to see a copy of the dress worn by Kate, Duchess of Cambridge when she visited Solomon Islands in 2012, the dress was made by Rarotongan label TAV (it's in a glass case at the library entrance). The big open and airy National Museum has a permanent exhibition space on the ground floor and a temporary exhibition space upstairs. 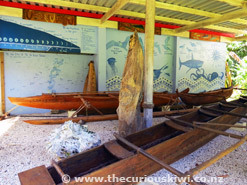 There are a few hundred objects in the museum and a lot of them are wooden including vaka (outrigger canoes) made from the wood of mahogany trees. There are also carved weapons, and carved traditional gods. 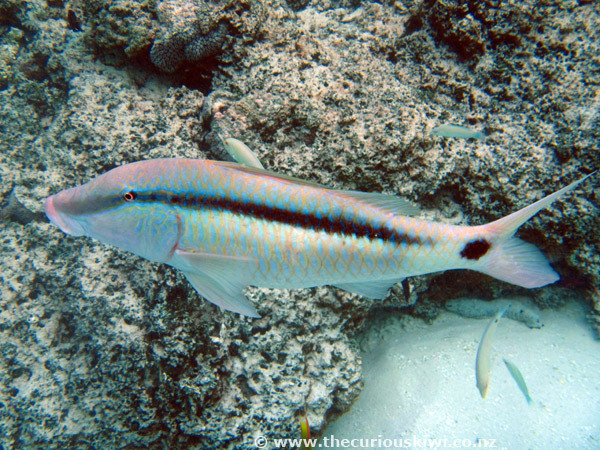 I was interested to read about some of the early carving tools - teeth from rats and sharks, and sting ray tails that had been stretched and dried. 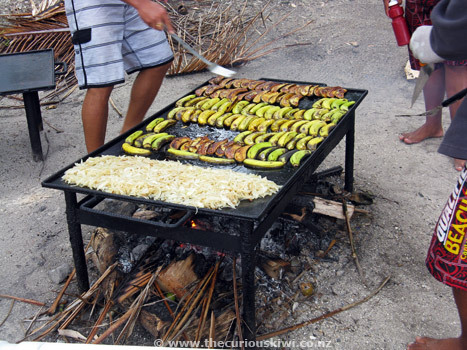 Other items on display include fishing implements, traditional dance costumes, and a large coconut grater along with other food preparation tools. 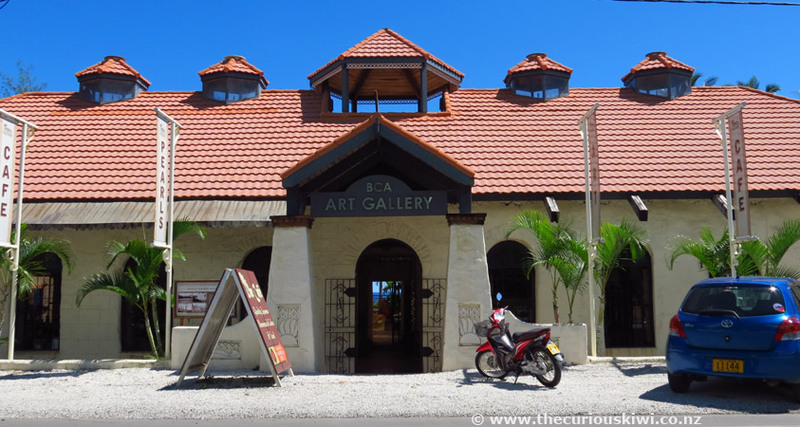 It doesn't take too long to look through the museum and it could be combined with a visit to the small museum at the local library (see above) as they are within walking distance of each other. Shopping hours are generally 9am - 4pm during the week and until 1pm on Saturday. Resort and village shops may be open in the evening and on Sunday. Bargaining isn't practiced in the Cook Islands. 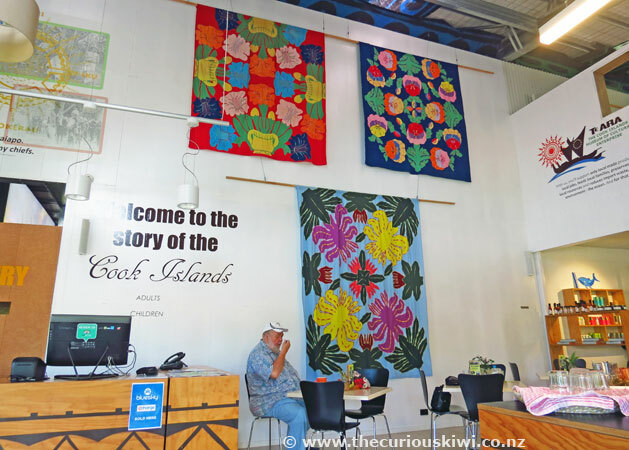 We spent time chatting to the lovely women at Pacific Weave and looked at all of the handmade products created locally as well as in other Pacific islands like Tonga, Micronesia and Fiji. I bought an angel made in the Marshall Islands, there is also jewellery, bags, baskets and tapa cloth. Check out their Facebook page to see the beautifully made creations. Open: Monday - Friday 9am - 4.30pm and Saturday 9am - 1pm. Perfumes of Rarotonga sell handmade perfumes, a range of body care products, perfumed candles, liqueurs and Noni juice. 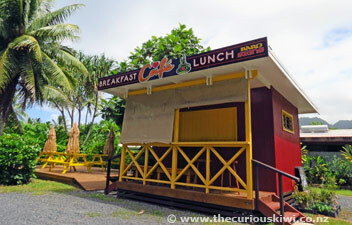 There are two locations - Cooks Corner in Avarua (also sells fudge) and the factory shop near the airport. Tivaevae Collectables have a range of embroided duvet cover sets, cushion covers and table accessories that are made in Bali and sold from their store in Nikao and online. 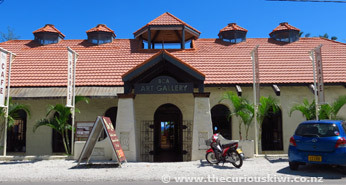 Originally constructed in 1845, the limestone Beachcomber building was rescued and restored in 1992 and now houses a gallery/gift shop that includes work by local artists including Kay George. 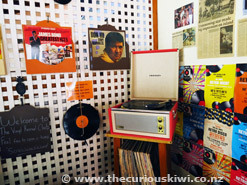 Retro style The Cafe is in the courtyard of the building and has a record player and selection of vinyl in one corner. 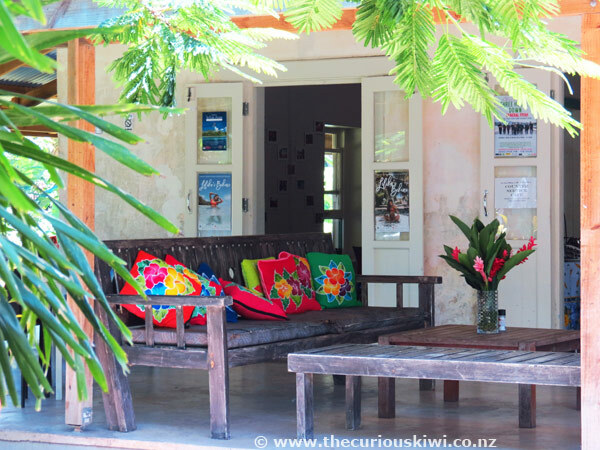 An exhibition space is behind the gallery/gift shop, Beachcomber is well worth a visit. I didn't get to The Little Red Gallery during opening hours, but it's easy to find as it is what it says - a little red gallery. The hours were written as Tuesday - Thursday 10.30am - 1pm, and Saturday at the Market, however the hours were written on a blackboard so no doubt they change. Maria sells her art work at Punanga Nui Market on Saturday mornings, and at her gallery next to Ariki Adventures in Muri. Once you've stayed in Rarotonga it's likely you'll become well acquainted with the island's alarm clocks, and like me, you may want to take home a reminder in the form of one of Maria's vibrant rooster prints. Maria's work is also sold along with other local art in the gift shop at Te Ara Museum in Muri. 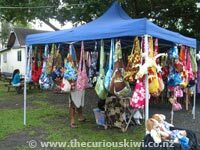 If you've ever wondered what you can do with used plastic wrapping, call in to the Big Fish Dive Centre in Aro'a and see the colourful ipad and cushion covers, coin purses, and handbags. 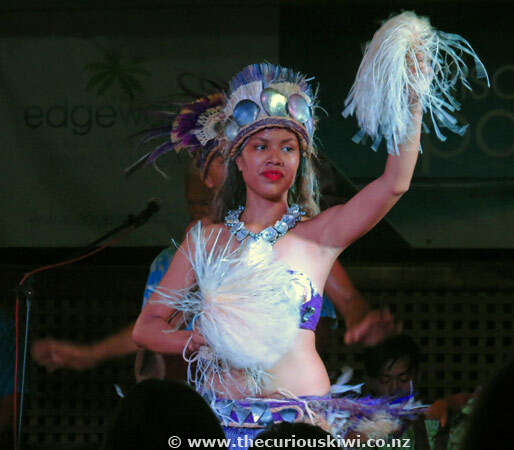 Read more about the creator Sabine and her mission to reuse and reduce Rarotonga's plastic via the Cook Islands News. Black pearls are an important means of income for the Cook Islands and a unique souvenir for visitors. Black pearls aren't something we found out about but see Moana Gems and Bergman & Sons for more information. Apparently there are fake black pearls out there so you can ask for a certificate of authenticity to ensure they're the real deal. TAV is a Rarotongan made fashion brand and they have a store in Auckland at 163 Onehunga Mall. 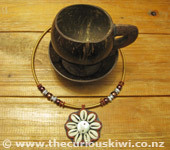 LuSantials clutches and coin purses are also made in the Cook Islands. 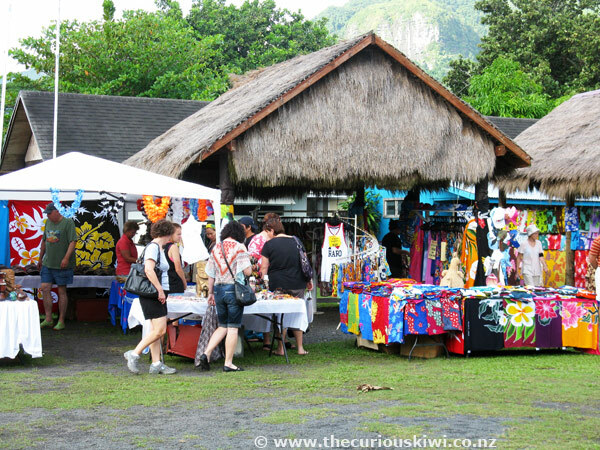 Souvenirs can be purchased at Punanga Nui Market and from souvenir shops around the island. 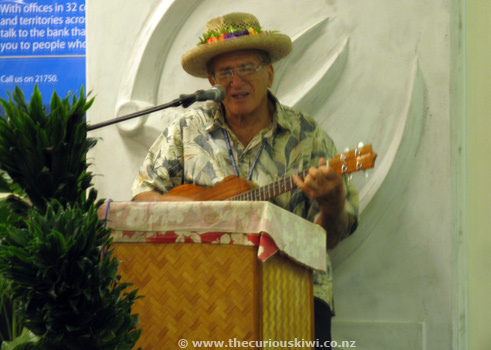 Ukuleles are a popular choice, some are made by prisoners and sold in the Prison Craft Shop in Arorangi. Look for the sign to the Prison opposite Edgewater Resort. Open 8.30am - 3pm, Monday - Friday. 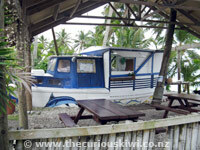 Island Craft in Avarua is a good option if you're looking for carvings. Island Craft label their locally made work, beware of imported copies you may find in other shops. 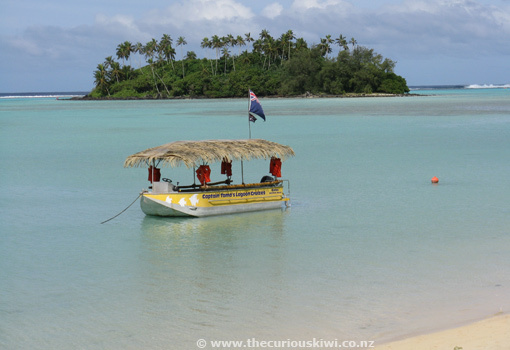 On a Captain Tama's cruize you can snorkel out near the reef in Muri Lagoon (best snorkelling of our trip in 2012), eat a BBQ lunch on the beach, and learn how to *tie a pareu (sarong). 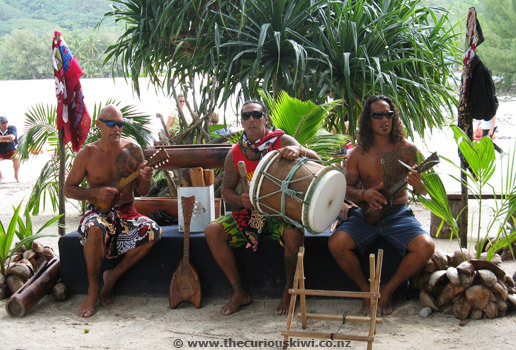 You'll be entertained by No Strings Attached - a string band made up of Captain Tama's crew. 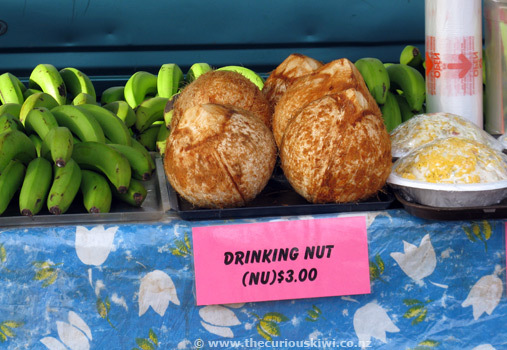 The crew will swap the ukuleles for a coconut or two and give a coconut husking and tree climbing demo, and finish with a hilarious coconut show. *You can buy a '7 Ways to Tying a Pareu' information card from a souvenir shop. The trip takes 4.5 hours (11am - 3.30pm) and includes a cruise in a glass bottom boat, 45 minutes of snorkelling (gear supplied if required), BBQ lunch, awesome entertainment and transfers from accommodation if needed - $79 adults. We recommend the trip for a seriously good laugh, and good snorkelling. The other day cruise option at Muri is Koka Lagoon Cruises (Sunday - Friday, departs 10am). Koka have also stacked up some excellent Trip Advisor reviews. 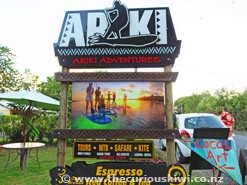 Ariki Adventures offer a number of water based activities and tours including Glass Bottom Kayak Tours, Stand Up Paddleboard Tours, and Ocean Sea Scooter Safaris. 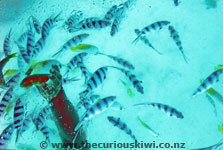 I had a chat to a friendly guy from Palmerston North who did a 90 minute Sea Scooter Safari in Muri Lagoon. He enjoyed the sea scooters and the tour so much he said he would do the tour again and ..... he saw turtles. 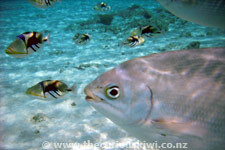 There are plenty of snorkelling spots in Rarotonga and most accommodation will likely have snorkelling options nearby. 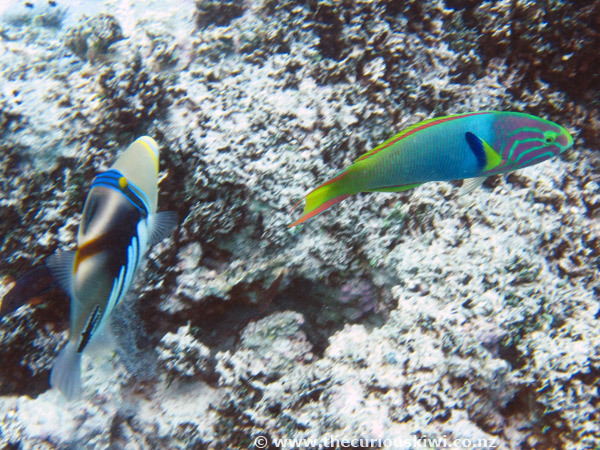 In 2018 we stayed at Palm Grove Resort in Vaimaanga and saw lots of colourful fish out snorkelling, some really close to shore. 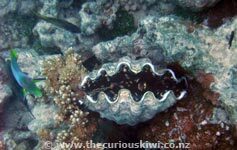 We also saw lots of either sea cucumbers (known as 'vacuum cleaners of the sea'), or sea slugs? Whatever they were, was their presence a good or bad sign? I don't know. Popular snorkelling spots include Fruits of Rarotonga at Tikioki beach which is located between Muri and Titikaveka. Look for the little lime green Fruits of Rarotonga cafe/shop, opposite is parking, a bus stop, and beach access for snorkelling. If you don't have gear you can hire it from Chantal's Concierge across the road. You can also snorkel off the beach from Charlie's Cafe, Bar & Beach Hire in Titikaveka (walking distance from Fruits of Rarotonga). Charlie's hires out snorkelling gear, kayaks and paddleboards. Other snorkelling spots are Aro'a Beach and Black Rock in the north west, Black Rock has plenty of parking and an information storyboard. 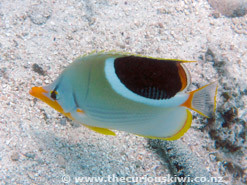 The snorkelling locations are labelled on the Cook Islands Sun fold out map, Dive Rarotonga have also put together some information about snorkelling. Muri Lagoon is a beautiful setting and it's a good spot for paddleboarding and kayaking. 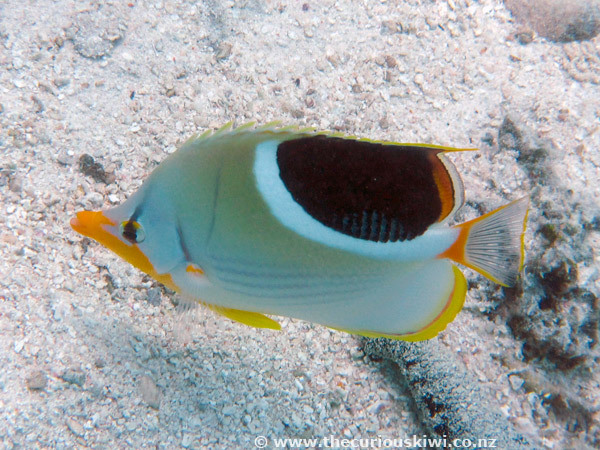 We went snorkelling in the lagoon on our first trip to Rarotonga and while there were a few fish around, we thought it was well worth going out on a boat cruise to get closer to the reef, reviewers also suggest heading out around the small motu (islands). 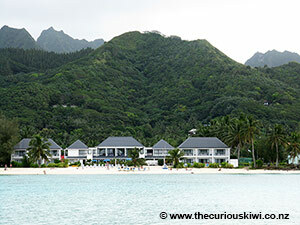 A few sources note lagoon pollution including The Cook Islands News - WATSAN project moving ahead, newer articles - Can Muri Lagoon be saved?, Lagoon National Disaster. Run off from farms (fertilisers and manure) as well as inadequate waste water and sewerage systems are cited as part of the pollution problem. The popularity of the lagoon is also no doubt contributing to the decline of healthy coral and fish life. It's a challenge for us all as tourists, tourism operators and local populations to preserve our environment but also benefit from the economic advantages that tourism brings, especially to countries like the Cook Islands where tourism is a major income earner. 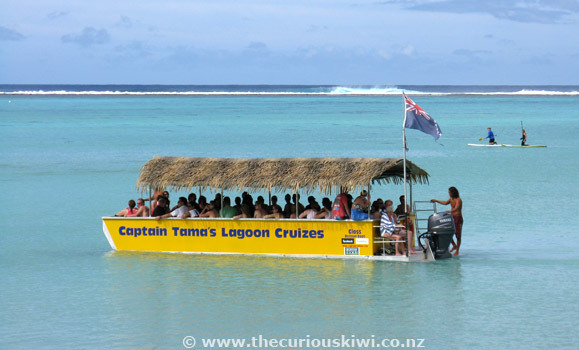 Koka Lagoon Cruises donate a percentage of their sales to the Rarotonga Lagoon Conservation Trust and Captain Tama's website has information about their environmental contribution and clam re-population initiative. As visitors we can dispose of rubbish responsibly, avoid standing on coral, and take short showers to help conserve water and reduce waste water. Most sunscreen is likely toxic to sea life so we've both bought rashies to help with sun protection, the added benefit is less sunscreen going into the water. Look for the SPCA sign and have some money ready as there is now a charge - $5 per car, $2 per scooter. 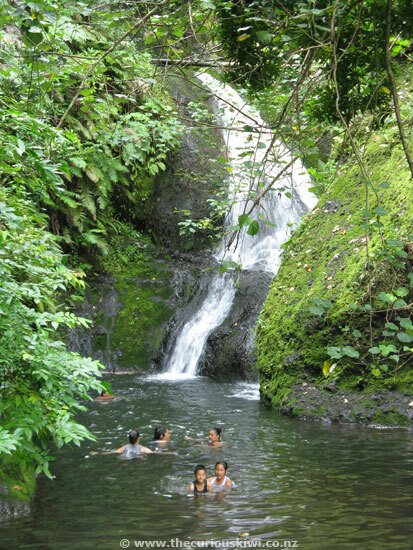 It's around a 2km drive to the waterfall which is in a bush setting. Reviewers note the mosquitoes and the possibility of a water trickle rather than a waterfall (depending on rain fall). There are two roads that circle Rarotonga, the coastal road Ara Tapu (Sacred Road, 32km) and the inland road Ara Metua (Ancient Road, 29km). We didn't drive on Ara Metua for a long distance but if you want to see farmland and get a bit closer to the mountainous interior of the island you might like to make the detour. 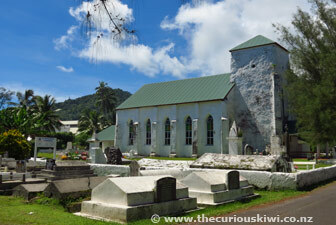 The only way to cross the island is on foot, Pa's Treks can guide you. The maximum speed is 50kph outside of built up areas, 40kph in towns and villages, and 20kph around schools during school time. In Muri and Avarua the speed limit is 30kph. 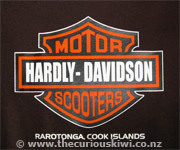 They might not have the Harley badge but motorised two wheels are the preferred ride for plenty of locals and visitors. The coastal road is in good condition, although there are potholes, also watch out for wandering birds and dogs. Note: New helmet and licensing laws - if you don't have a motorcycle licence you'll need to get one to hire a scooter - see Please Read information via Adventure Cook Islands. A few scooter hire options: Polynesian Rental Cars (6 locations), Tipani Rentals (opposite Edgewater Resort), and Island Car & Bike Hire (3 locations). Harley Davidson tours were once offered, but no longer, might be an opportunity there for a Harley rider who could get used to island life. Note: Check your insurance to make sure you're covered to ride a scooter. A clockwise bus departs Cooks Corner on the hour heading toward Tupapa. An anti-clockwise bus departs Cooks Corner at 30 minutes past the hour heading towards Nikao (towards the airport). It takes around 50 minutes for the buses to do a lap of the island, tell the driver where you want to get off when you board. See Busaboutraro for the schedule. Note: On Sunday the clockwise bus departs Cooks Corner from 8am - 12noon and then 2pm - 4pm. There is no Sunday night bus, or Sunday anti-clockwise bus service. Cost - $5 one way, $8 return, $16 for a day pass or buy a 10 trip ticket for $30 (buy tickets from the driver). There are a few bus stops around the island, if you're in an area without a bus stop you can signal the driver, don't be shy, otherwise they'll whistle on by. 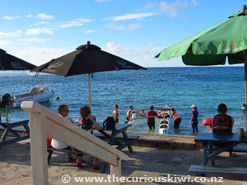 There are some popular spots where people get on and off - Fruits of Rarotonga and Black Rock (for snorkelling), Charlie's Bar in Titikaveka, and Muri Village. Note: On one of my bus trips some passengers were using the bus to get to the airport and the driver charged them $2 for each piece of luggage. Fair enough, as he said the bus is for people, not bags, so it's best to organise an airport transfer. You will probably find taxis outside the airport when you arrive, if not someone will be able to organise one for you. 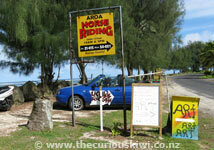 Taxis aren't cheap in Rarotonga though and an airport transfer will likely be better value. In Tonga and Samoa taxis drive around looking for business, this isn't the case in Rarotonga, they're the phone and book variety. In March 2018 we hired a Toyota Yaris from the friendly staff at Avis in Avarua. 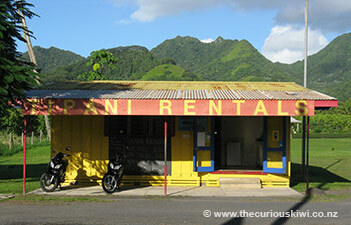 It was low season in Rarotonga so there was an excellent deal for $35 a day for a minimum three day hire. Petrol was $2.08 a litre. 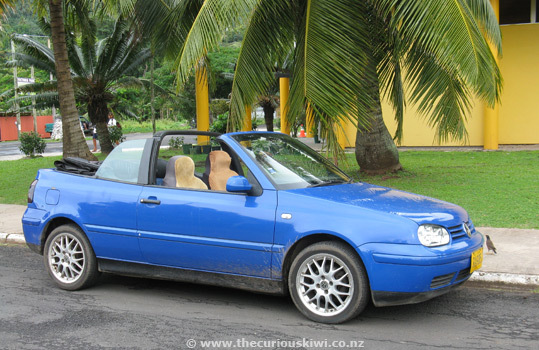 If you're keen on a convertible, we saw a few Mini Cooper convertibles around the island, Polynesian Rental Cars is one option for hiring those and Island Car Hire & Bike Hire have Nissan Micra convertibles. Note: Visitors from Australia, NZ, US, Canada, UK and the EU can drive cars using their own licence, there is no need to get a Cook Islands licence. 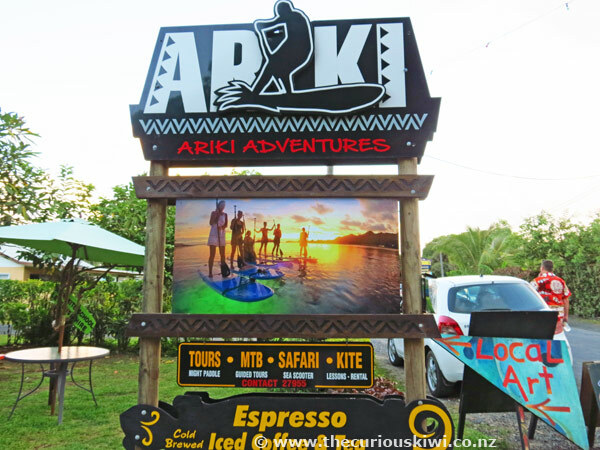 Muri is a popular little hub on Rarotonga and as well as being water activity central and home to Captain Tama's Cruizes, Koka Lagoon Cruises, Ariki Adventures and KiteSUP, it also has a number of accommodation options. There is also a pharmacy, doctors surgery, car and bike hire, and Treasure Chest souvenir store. 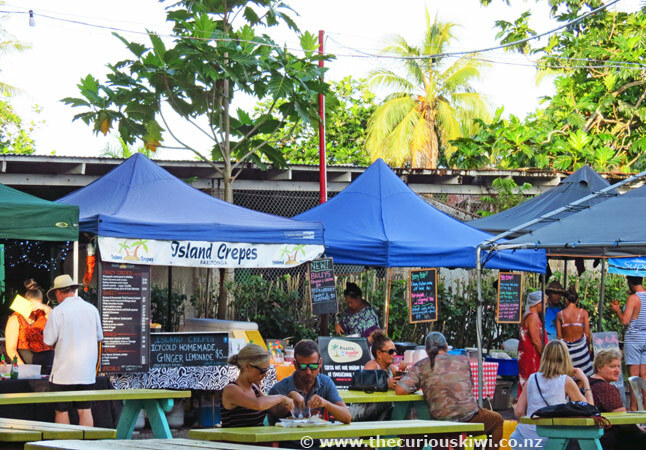 There are a number of places to eat including Muri Night Market, LBV bakery and cafe, Deli-Licious Cafe, La Casita Cafe and Sails Restaurant. 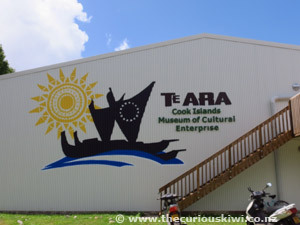 A recent addition to Muri is Te Ara - The Cook Islands Museum of Cultural Enterprise. Entry to the museum is $15, there is also a cafe, and gift shop selling only locally made products. You can refill water bottles at the water filter station and charge devices free of charge. We enjoyed our lunch in the cafe and the gift shop is worth a visit, the museum will be one of our first stops when we return. 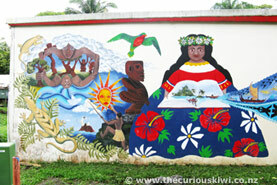 Look for the big building painted with frangipani flowers. Open 7 days 8am - 4pm. 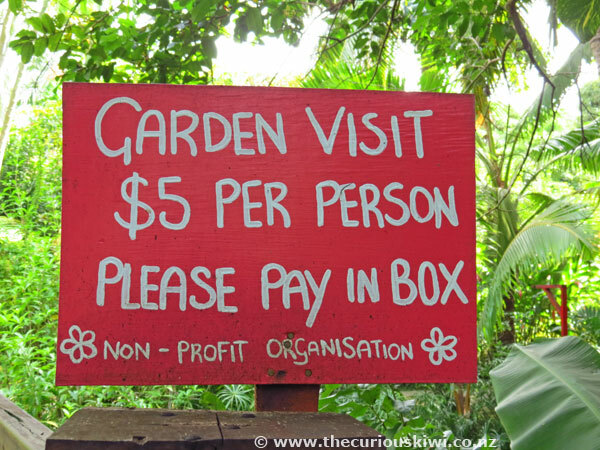 There is a $5 charge to visit Maire Nui Gardens and you'll find a red box for payment at the garden entrance. It's not a huge garden but it's a lovely peaceful spot and there are colourful and unusual plants to see as well as some pretty butterflies. The cafe was closed until 11 April 2018 when I visited, it would be helpful for cafe closures to be noted at the entrance as there were plenty of disappointed visitors in the garden the day I was there. If you're travelling by bus and find the garden cafe closed, it's a short walk to Charlie's Cafe & Bar, open from 11am. 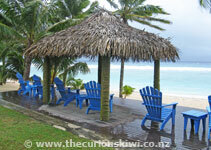 Bike hire - Ride Rarotonga and Adventure Cook Islands. Electric bikes - Tik e-bikes. 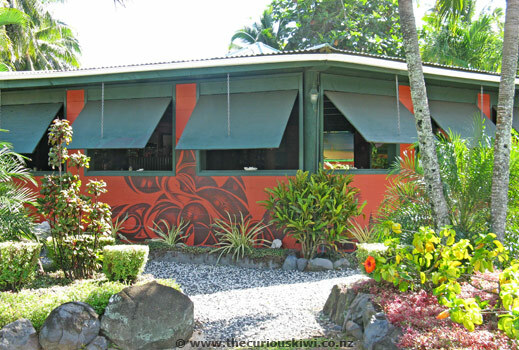 For those self catering: CITC Supermarket is located half way between the airport and Avarua, Foodland is in downtown Avarua on the main road, Prime Foods is on St Joseph Road in Avarua, and Wigmore's Supermarket (open on Sunday) is in Vaimaanga. 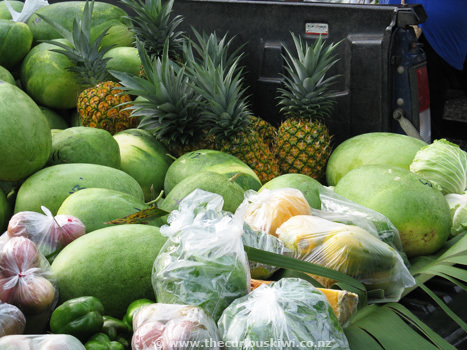 Visit the Punanga Nui Market on Saturday, and road side stalls for good value produce. You can also take food from home, as long as it's not fresh, declare it at Customs on arrival. Food & drink prices 2018: Foodland in Avarua - 250g Mainland cheese $5.70, Lisa's 200g dips $6.20, 1 litre Green Valley milk $4.99, loaf of Avarua bakery wholemeal bread $5.20, 6 eggs $3.30, 375g peanut butter $4.70, 60 Bell tea bags $5.40, 150g Bluebird chips $4.10. Wigmore's Supermarket in Vaimaanga - 200g Cadbury chocolate $6.50, Oyster Bay Chardonnay $28, Mills Reef Chardonnay $25, 330ml Steinlager Pure $3.20, 330ml Heineken $2.90, 1.5 litre Schweppes $7.60. Also see Prime Foods on Facebook as they often post their weekly specials. 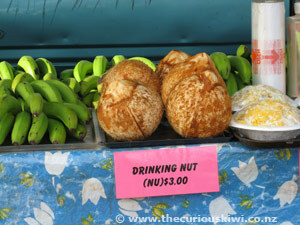 See the Muri Night Market and Three Memorable Meals in Rarotonga blog posts via thecuriouskiwi/blog. 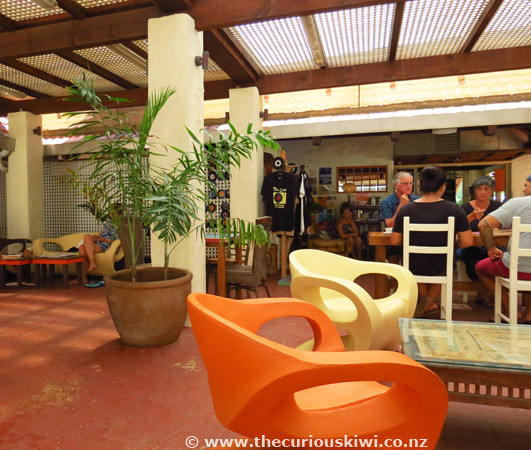 I spent a few nights in Avarua in 2018 and Trader Jacks was a convenient spot for dinner and drinks. Trader Jacks is so close to the water that you could have a dip before dinner if you wanted to. 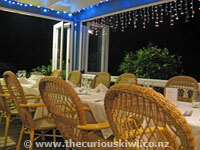 The menu is online and has a selection of pizzas, burgers, fish 'n' chips and other seafood and meat dishes. You can dine in the casual bar or upstairs in the restaurant. 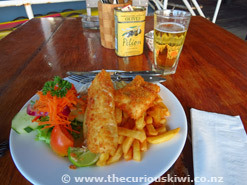 I sat in the bar by the sea with fish 'n' chips ($16.50) and watched families cooling off in the water. The local Cook Islands lager is on tap ($5 a glass), and as a nod to the cyclones that have battered Trader Jacks over the years there's also a Trader Jacks Tropical Cyclone American Pale Ale. (Trader Jacks is open Monday - Saturday from 11am, closed on Sunday). My helpful host Malcolm at Central Motel told me that Bamboo Jacks was open for dinner on Sunday nights, so Bamboo Jacks it was. 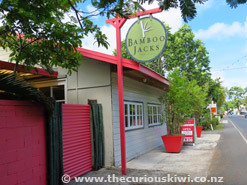 Bamboo Jacks opened in 2011 and is owned by Jack Cooper aka Trader Jack. 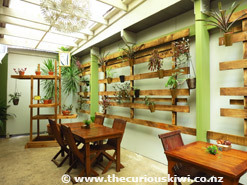 You can eat in and there's a lovely courtyard as well as indoor seating, or takeaway, the menu is on the website. 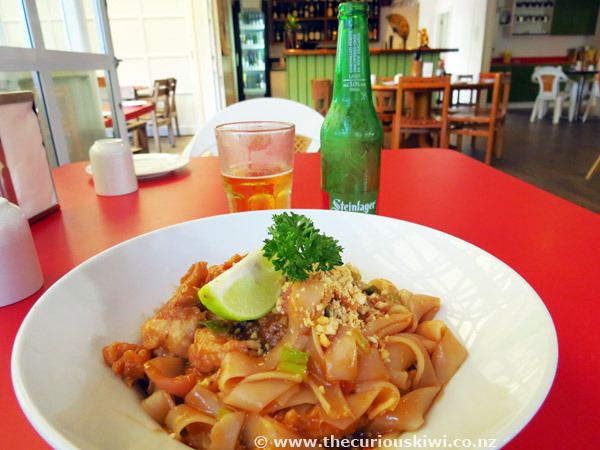 There are a number of Asian dishes to choose from, I went with an old favourite - Pad Thai with chicken, add a bottle of Steinlager and it came to $25. I enjoyed my meal which was made even better because of the friendly staff. (Bamboo Jacks is closed on Saturday, open from 5.30pm Sunday - Friday nights for dinner, and lunch on Friday from 11.30am - 2.30pm). 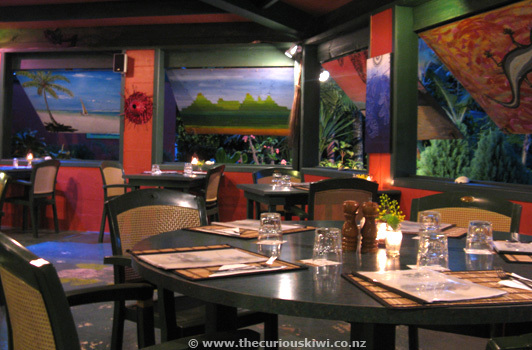 We had dinner at colourful Kikau Hut during our first trip to Rarotonga in 2012. We ordered a chicken satay entree, two main fish dishes, two glasses of NZ wine and lemon cake to share for dessert, the bill was around $90. 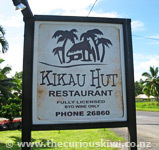 (Kikau Hut is within walking distance of Edgewater, and Sunset Resorts). 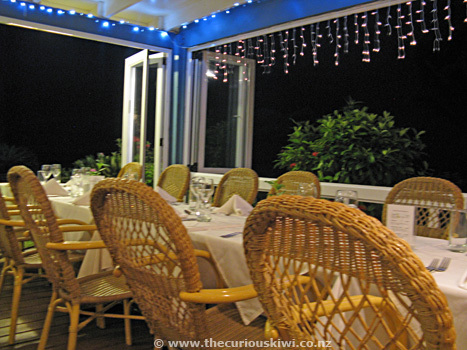 We recommend booking a table at Spaghetti House as it's part of the large Edgewater Resort. We returned for dinner in 2018 and recommend it as a family friendly, good value dining option. Pasta dishes are priced from $15.50, pizza from $18, and dessert from $8.50. There are other main meal choices like pork cutlets, fish, and chicken as well as gluten free options including pizza. 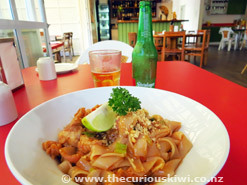 (Spaghetti House is located outside Edgewater Resort on the main road, open 7 nights from 5pm). 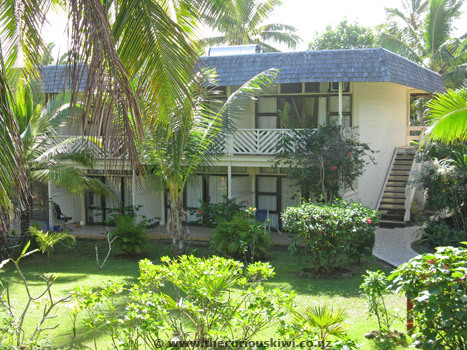 Tamarind House is a restored colonial style property by the sea, a couple of minutes drive from Avarua. It was closed for an annual holiday when we visited Rarotonga in 2018, but on our first trip we dined in the evening and it was beautifully lit with candles and fairy lights. Staff were delightful, and served one of my favourite dishes of the trip - a smoked chicken and tropical fruit salad with a honey and lime dressing. The $88 bill included two glasses of NZ wine, two mains, and a lovely lemon sour cream cake to share for dessert. 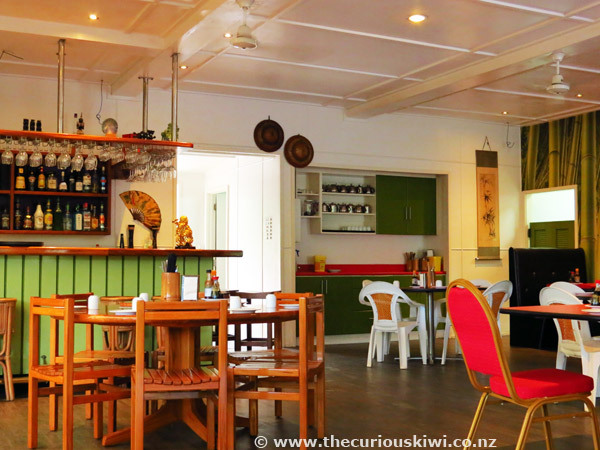 (If you're staying at Club Raro Tamarind House is within walking distance). Cafe Salsa has plenty of seating both indoor and out, and a long all day breakfast/brunch menu priced from $10.50 for triple eggs. 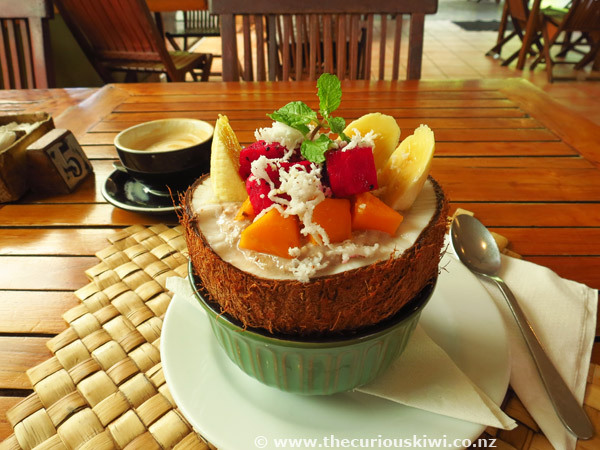 One morning I had the 'rise and shine' - a coconut filled with rolled oats, bananas, berries, chia seeds, almond milk and fresh local fruit, it looked and tasted good and at $15.50 came with a free refill, not that I could manage it. They brew Roasted Addiqtion coffee and have an equally long drinks menu that includes milk shakes, smoothies, iced coffee, juice and nu (young drinking coconut). Open Monday - Friday 7.30am - 3pm, and 7.30am - 2pm on Saturday. 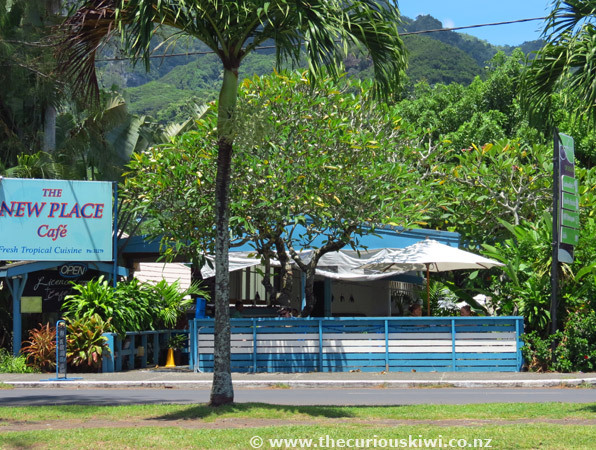 The New Place Cafe is decked out in vivid blue and it's opposite the Punanga Nui Market so it's a convenient place to sit and relax after visiting the market on Saturday morning. I called in for a breakfast of coconut pancakes and yoghurt ($14.50). Lunch is served from 11.30am and the menu includes curries, sliders, paninis and at least 17 other dishes. There's a lot of choice at The New Place and you'll find the menu posted on a board outside or on Facebook. Open Monday - Saturday from 7.30am and open some evenings for dinner, check Facebook to confirm. 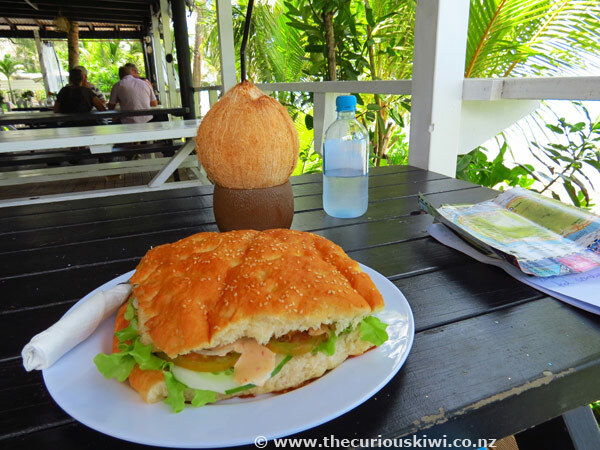 I spent a hot morning walking to both of the museums in Avarua and The Cafe is well placed to take a break for a cold drink and a snack. 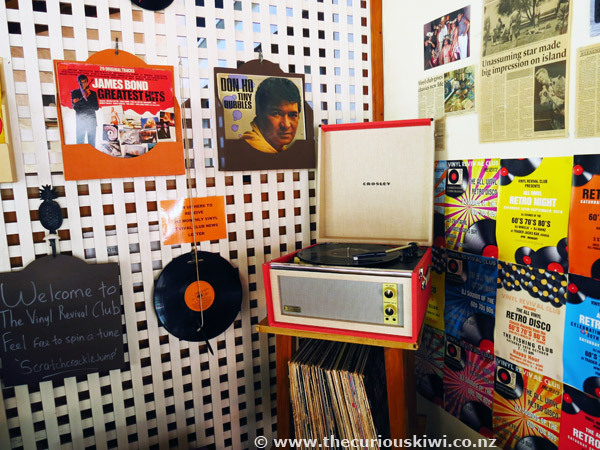 The Cafe is in the open air courtyard of the Beachcomber Building and has a retro / record theme with a record player (choose a tune) in one corner as well as books and magazines to read. I sat cooling off with a glass of apple juice and a paw paw muffin while listening to waves crashing in the distance. Another visit for morning tea found The Cafe busy with locals taking five for coffee. Open Monday - Friday 9am - 3pm, Saturday 9am - 1pm. 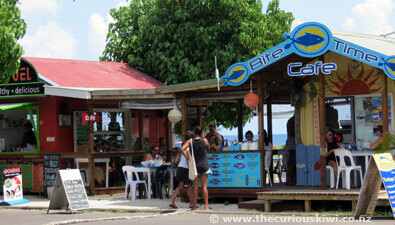 Charlie's Cafe & Beach Hire is a casual spot where you can hire the gear to snorkel, kayak or paddle-board off the beach. Fish is served a few ways and I chose the fish sandwich ($14). The sandwich was a whopper, and big enough to share, the fish was tough though so it probably spent too much time in the pan. A cold drinking coconut on a hot day is a good combination though, and Charlie's also shakes up cocktails to serve by the glass and jug. Open Monday - Saturday from 11am. 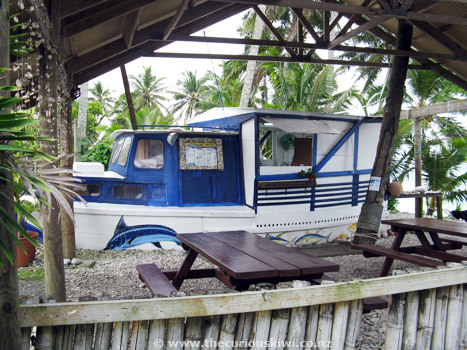 Order your fish 'n' chips from the cute blue and white boat that sits on the sand, a few steps from the sea. Add a beer from the Game Fishing Club at the same location. Flying Boat opens at 11am, Game Fishing Club from 1pm, both are closed on Sunday. (Two other fish 'n' chip options: Palace Takeaways, Avatiu harbour in Avarua and the cute little yellow and blue Pacific Fish & Chip Shop in Arorangi). Cook Islands Tours take visitors to local homes to enjoy home cooked food and learn about how local people live - see Rarotonga Progressive Dinner on Facebook and Progressive Dinner via their website. 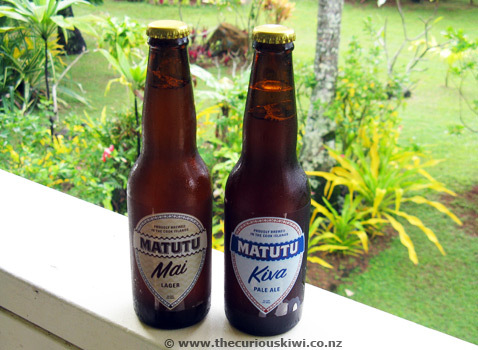 Matutu Brewing Company brew Mai (lager) and Kiva (pale ale). Every week day at 12noon and 1pm brewery tours are offered for $15pp, pick up can be arranged for an extra $10pp. It's not a tour as such as the rustic brewery is small, but the guys behind it are passionate about what they do. We enjoyed learning about the beers, the brewery (the kit came from Tuatara Brewery in Wellington), and the origins of the beer names and labels. 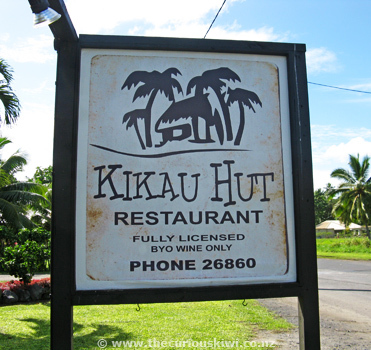 We also got to sample the Mai and Kiva along with their coconut stout, and liked their craft beer bottle collection. If you develop a taste for Matutu beer you'll find it at a lot of bars and restaurants in Rarotonga. 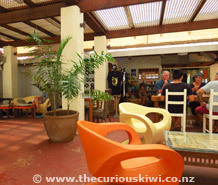 Rarotonga Brewery has a really nice little tasting room run by friendly staff. 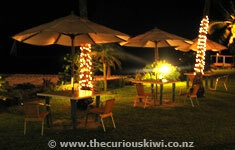 A glass of the onsite brewed Cook Islands lager is $4 or takeaway a 1.5 litre bottle for $13 (refills $11). The brewery is a partnership between a local couple and the owners of Hallertau Brewery in Auckland so you'll find Hallertau brews on tap as well. Locally made Kombucha is also sold, along with merchandise including refillable flagons. 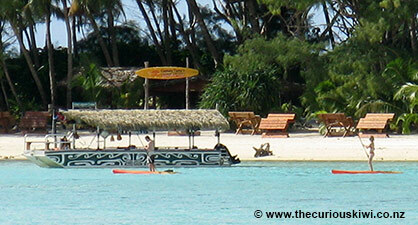 Call in for a Cook Islands lager Monday - Saturday between 10am - 6pm. 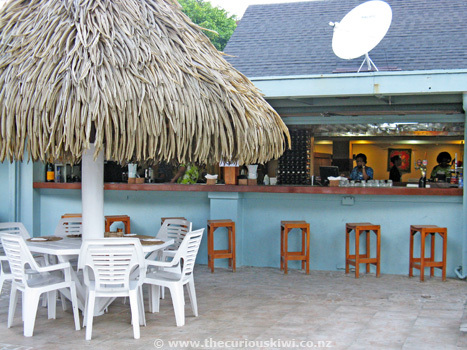 Hula Bar at The Islander Hotel opposite the airport probably has the best happy hour on the island - $3.50 beer, $4 spirits and $5 wines all day from 11am. When we called in for a beer we had the seaside bar to ourselves but I imagine it's a very popular place to be in the evenings. 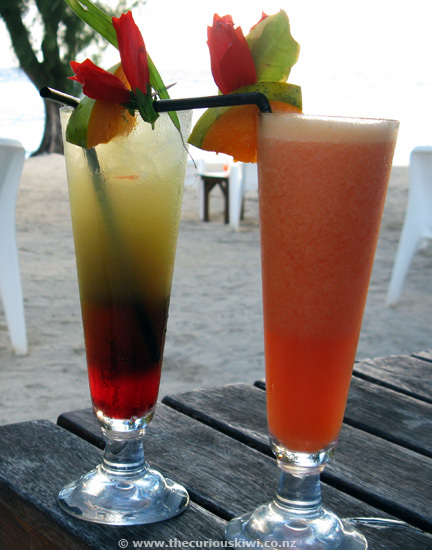 Also in Nikao is Vaiana's Bar & Bistro on the beach and it also has a happy hour. 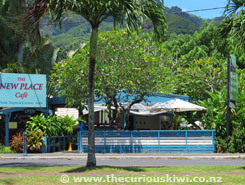 As you're travelling around Rarotonga keep an eye out for happy hour signs, another option is The Barefoot Bar at Pacific Resort in Muri which has happy hour at both 4pm and 8.30pm. Palm Grove has 22 self-contained bungalows set over five acres, choose either a garden setting or beach front. We stayed in a well equipped Garden Studio a few steps from the pool and a short walk across the road to the beach. 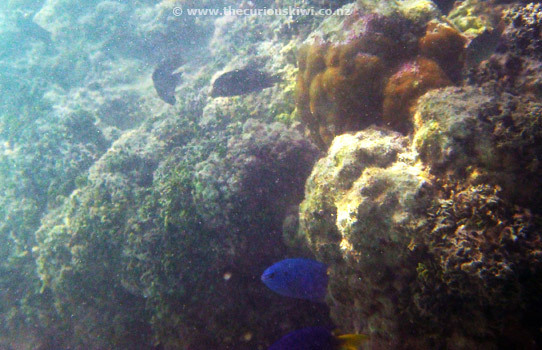 We saw plenty of colourful fish out snorkelling, there were a lot of sea slugs though. 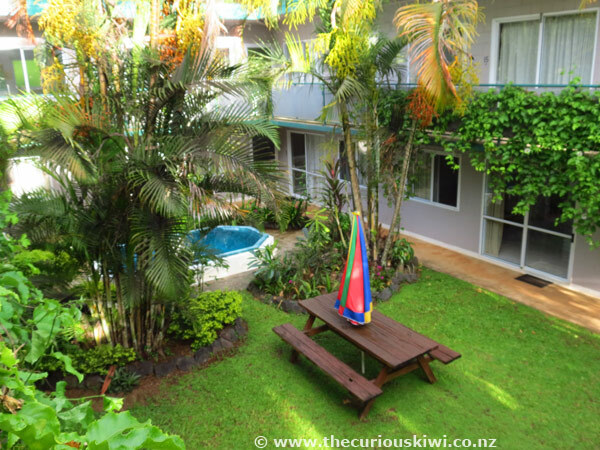 There's a long list of handy facilities at Palm Grove including a guest BBQ, laundry, book swap, onsite electric bike and motorbike rental and complimentary snorkel gear and kayaks. It's also a short walk to Wigmore's Supermarket, a popular place for people to gather on Sunday afternoons for big $3 ice creams. 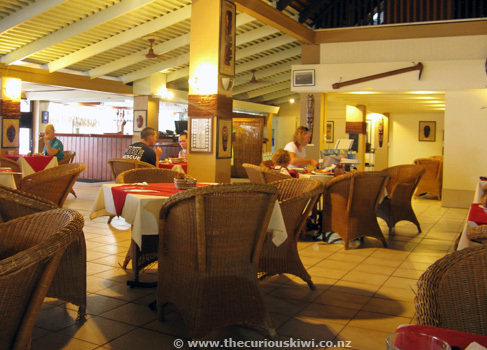 Palm Grove is well kept and maintained and it was a pleasure to have breakfast (included in the room rate) in Yellow Hibiscus restaurant every morning. I also had a tasty ika mata in the restaurant for lunch, on Friday night there is an excellent happy hour for guests, and on Sunday a BBQ with live entertainment. 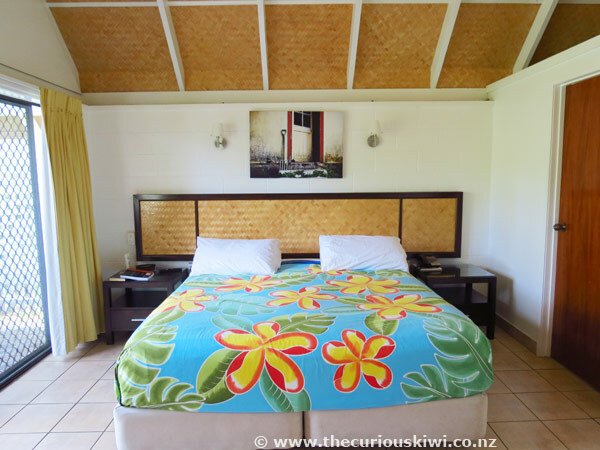 We recommend Palm Grove as a top notch mid range accommodation option on Rarotonga and we can see why it gets plenty of repeat visitors, we hope to be some of them. There's nothing fancy about Central Motel in Avarua but if budget and location to town are top priorities then it's a good choice. 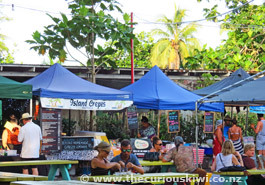 Trader Jacks Bar & Restaurant is at the end of the street, Punanga Nui Market and the small town centre are a short walk away. 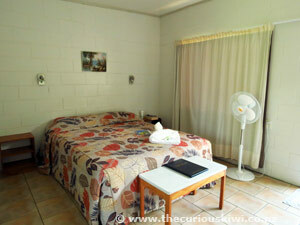 While the rooms may be dated, they're a decent size and mine was exceptionally clean. 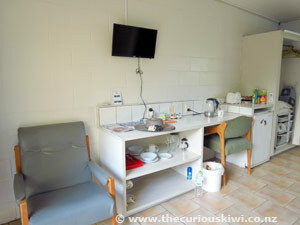 The room had a new air con unit and a chair that looked brand new despite it probably being around since the 1970's. Central Motel's owner Malcolm is a friendly and helpful host and if I was looking for budget accommodation in Avarua again I would happily return. 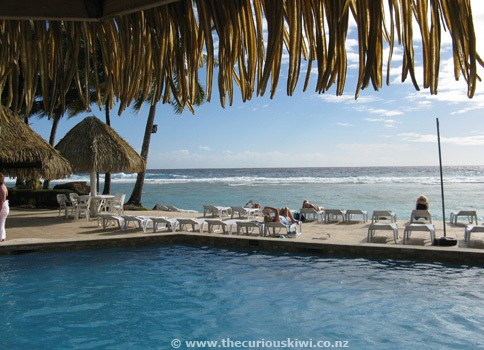 Edgewater is the largest resort on the island, it's family friendly and has a Kids Club. 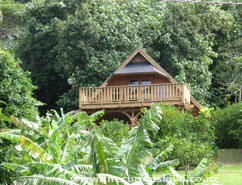 The resort was offering a deal on garden rooms and we booked for that reason. Trip Advisor reviews for garden rooms were varied so our expectations weren't high but we were happy with our room, it was on the second level at the back of the property, was spacious, and had a sliding door out to a small balcony. There were tea and coffee making facilities, flat screen TV, bar fridge, an air conditioning unit (a bit noisy but didn't bother us too much), and an in room safe (you might think it doesn't work, it probably does, persevere with the instructions). The bathroom was a decent size, nicely tiled and in good condition. The room was clean and serviced daily, the decor and some fittings could be upgraded but we had no complaints. 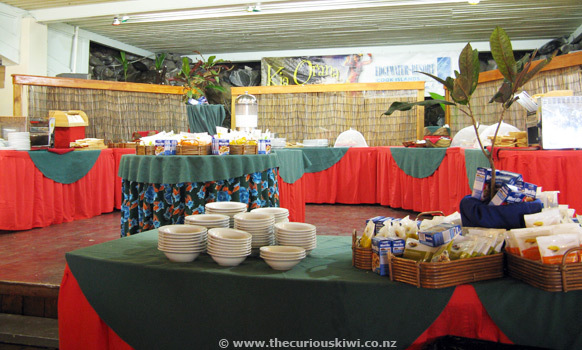 Tropical buffet breakfast was included and was more than adequate - fresh fruit, gluten free options, muffins, cereals, tea, coffee, toast, and juice. Note: If you would prefer to stay at a smaller, more modern resort in the area for a similar price, I recommend you take a look at the garden/pool side studio rooms at Sunset Resort. Sunset has consistently excellent Trip Advisor reviews. Whilst we didn't stay, we did go to Drum Beat Bar for happy hour and the photos on the website are representative of the exterior of the property. It's not an option for all families though as it has a no children under 12 policy. There's a swimming pool, tennis courts and games room, plus a schedule of daily activities, most are free. 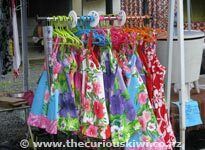 Activities can include fish feeding, water volleyball, ukulele and drumming lessons, and sarong making and tying. On Sunday there's a bus service to church. The onsite shop Treasure Chest sells competitively priced souvenirs. We went to a drumming session and tapped out a few tunes, but it's You Tube who can show you how it's really done. We also attended an informal history and cultural session led by Tick Daniel's, and highly recommend it. One of the more curious things he mentioned was remote Palmerston Island, the only Cook Island where English is the native language. Englishman William Marsters arrived on the uninhabited island in 1862 with at least one Polynesian wife. He went on to father 17 or 23 children (depending on the source) and died in 1899 at age 78 with 54 grand children. The Masters (changed from Marsters probably due to pronunciation) family were granted ownership of the island in 1954. 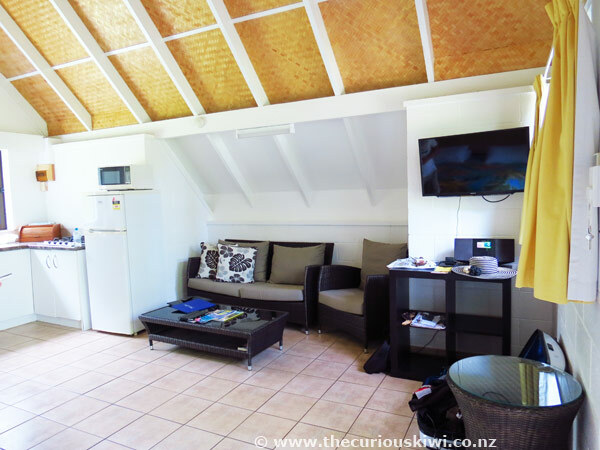 The following is a random list of accommodation options with the exception of The Cooks Oasis Holiday Villas - a well priced self contained property recommended to us by fellow Kiwis. If you're booking your trip independently Rentraro.com manages around 80 tourism rental properties. 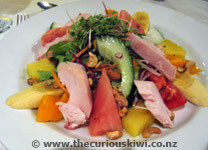 (Rentraro won an Air NZ Supreme Award for Excellence and Innovation in 2011). 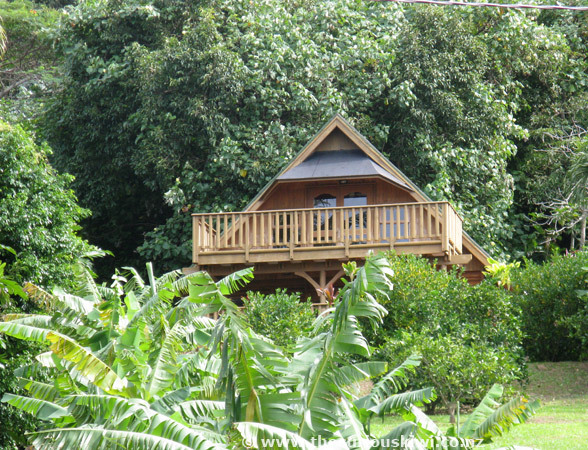 Island Hopper Vacations is another option. Travel agents can give you brochures that include Wedding Package information. Tiare Films can film your special day and their website includes a Wedding Services Directory. It may be an option to incorporate an Island Night (feast and music/dance show) into your reception, especially if you're on a budget. Arrive quietly and in style for your wedding in a white e-tuk limo. Highly recommend taking your own snorkelling gear and reef shoes, also a rashie for sun protection and to lessen the need for sunscreen in the water. Casual clothes and flat shoes. If you intend to go to church pack something smart that covers your shoulders. Some people recommend ear plugs to silence the roosters, we never heard any though (first trip). Second trip we did, every day, they're handsome birds though and who can blame them for showing off. There's no street lighting so take a small torch, or use your phone. 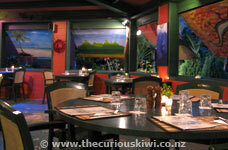 A smile, and the intention to relax into island time...... have a tumeke adventure. Akono'Anga Maori - Cook Islands Culture, various contributors, edited by Ron Crocombe & Marjorie Tua'inekore Crocombe. 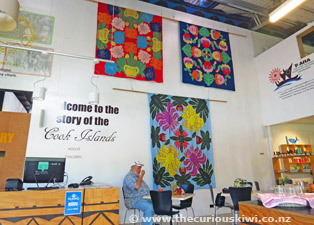 The Art of Tivaevae: Traditional Cook Islands Quilting by Lynnsay Rongokea. Tivaivai: The Social Fabric of the Cook Islands by Susanne Kuchler & Andrea Eimke. Patterns of the Past: Tattoo Revival in the Cook Islands (Facebook) by Therese Mangos & John Utanga. 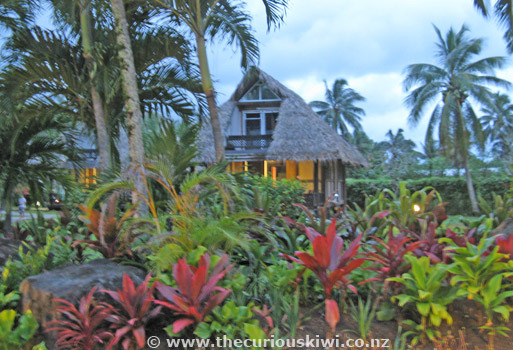 Atiu: An Island Community by various authors including Ngatupuna Kautai. Island Boy: An Autobiography by Sir Thomas Davis. An Island to Oneself by Tom Neale. Me'a Kai - The Food and Flavours of the South Pacific by Robert Oliver with Dr Tracy Berno and Shiri Ram. 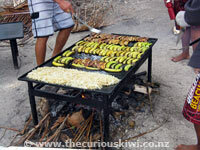 A large (493 page), colourful book containing information on Pacific cuisine and recipes from various Pacific regions including the Cook Islands. 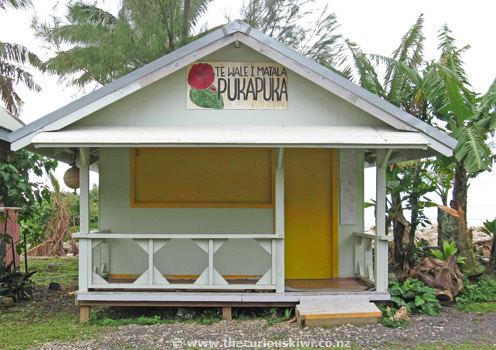 To find more books about the Cook Islands visit Bounty Bookshop on Takuvaine Road in Avarau, and the Cook Islands Museum and Library Society on Makeatinirau Road in Avarua. Visitor membership to the library is $30 for 6 months, $10 is refunded when borrowed books are returned. 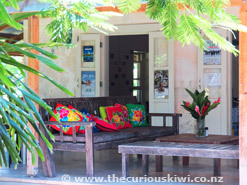 Look out for a free copy of Escape magazine (published twice a year), and the free Cook Islands Sun tourist newspaper. 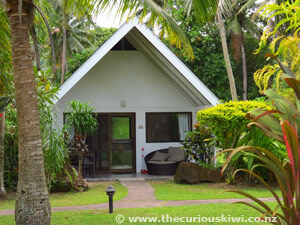 It took us a while to return to Rarotonga but our stay reminded us that it is a stress free and relaxing place to holiday. 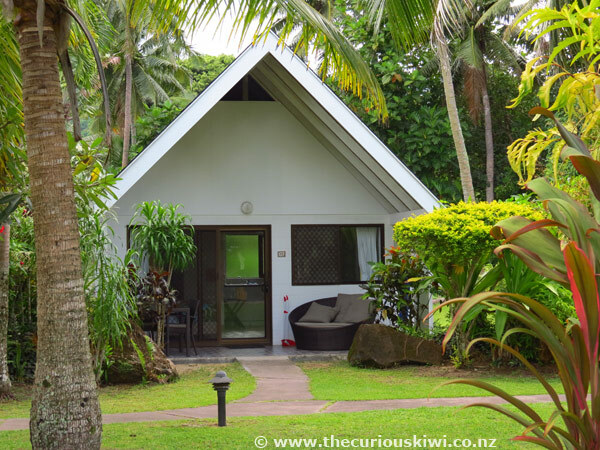 We visited in March so there wasn't the added attraction of escaping a NZ winter but the flip side was that nowhere was especially busy and we got a cheap low season rate for a rental car. 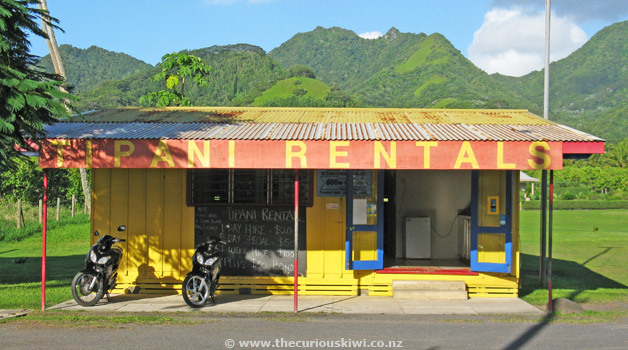 If you're someone who likes to explore your surroundings I'd recommend hiring a vehicle, Rarotonga is a small island so you can cover a lot of ground in a short time. There is always an element of luck with the weather but we were fortunate to have 10 straight days of sunshine. 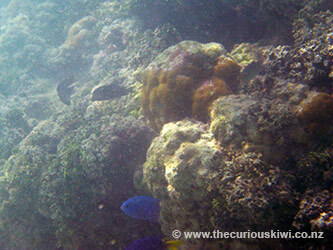 I'd forgotten how warm the water is but once again snorkelling was one of the highlights of our trip. It's disappointing not to find any information about action being taken to address the pollution problems in Muri Lagoon, The Cook Islands News seems to have gone silent on the issue. I hope for the future of Rarotonga and for New Zealand that as much time and resources can be put into protecting and preserving our natural environments as there currently is in promoting them. Something that is being preserved and promoted is the language, at least two words of it. Almost everyone I spoke to said Kia Orana in greeting and after a couple of days it was natural for me to say it as well. 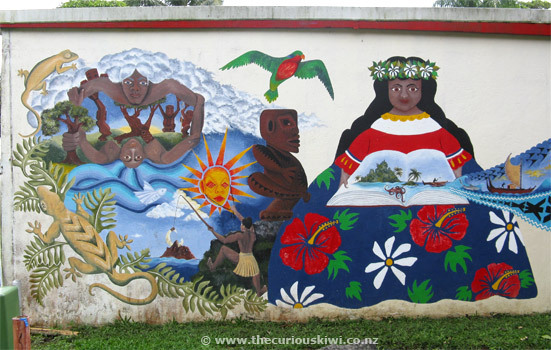 It occurred to me that I can go to many countries in the world and be greeted in English but there is only one little country where I'll be greeted with Kia Orana and I think that's special. Kia Orana is more than two words, and more than a greeting, infact now that I'm home I read there is a Kia Orana campaign, it's obviously working. 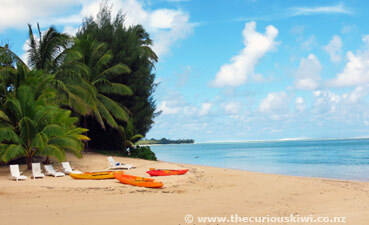 While Rarotonga is the subject of this guide there are other Cook Islands to visit - Aitutaki, Atiu, and outer islands. Comments to date: 35. Page 1 of 2. 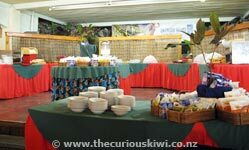 Our hotel should be around Muri area but we planning to go Aitutaki Sat after visiting Saturday Market. Just would like to know is there any place or hotels offer luggage storage services around the market ? How much for one pieces. Admin: Hi there I don't know of a luggage storage option near the market but you could check with the Visitor Centre. 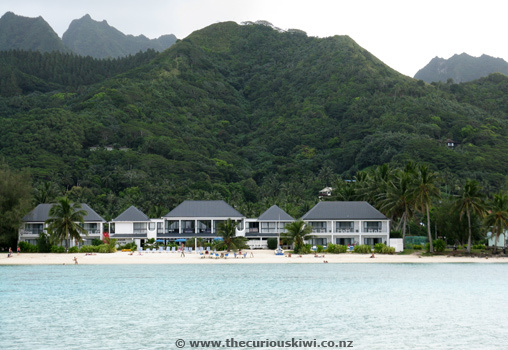 Air Rarotonga and the Islander Hotel opposite the airport offer luggage storage so you could drop it off and then get a bus to the market. 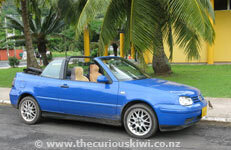 Alternatively, a rental car with airport drop off would provide the airport transfer and luggage storage. Have a great trip. Hi, its my first time going to Raratonga. Could you tell me how much are there beer prices please. Such as Stienlarger Pure, Lion Red. Admin: Hi there, we drink the local Cook Islands lager or Matutu beers which are probably the cheapest option on the island, however the Islander Hotel (opposite the airport) has happy hour from 11am and has Lion Red and Steinlager for $3.50 (this is probably the cheapest you'll find it on the island at a bar/restaurant). Wigmore's Superstore near Palm Grove on the southern side of Rarotonga sells 330ml Steinlager Pure for $3.20 and prices at other stores will be similar, there's also the Bond Liquor Store opposite the Punanga Nui Market in town. 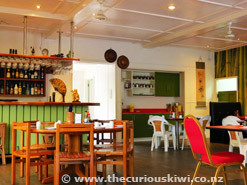 Check out the nice little tasting room at Rarotonga Brewery (near the Islander Hotel and airport) - if you like the Cook Islands lager it's $13 for 1.5 litres. Happy travels. 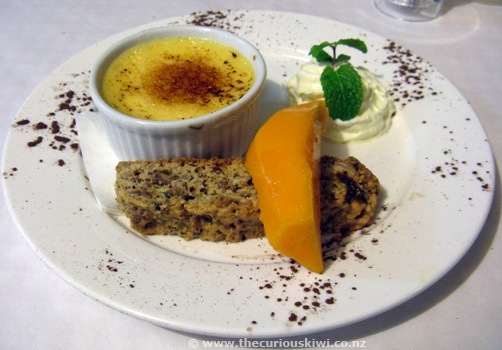 ARe we able to take NZ chocolate with us to Rarotonga? Admin: Yes, any packaged food is fine, apparently lots of people take KFC so no problem with chocolate. 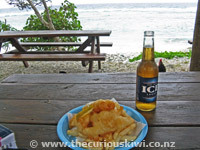 Can we buy the beer jugs from cook island lager online? Admin: Hi, It says on Rarotonga Brewery's website that merchandise be picked up at the brewery, but you can always email them and ask. Hi, I was just wondering whether it is worth bringing our boogie board with us? 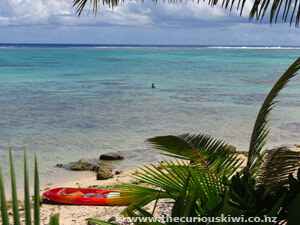 Admin: Hi from Rachael, not Admin We're not surfers or body boarders, but I had a look on AdventurCookIslands.com and they say Rarotonga isn't suitable for beginners as surf breaks on the reef just below the surface. If you're not a beginner, they hire body boards which could save you taking your own. The site also lists body board and surf spots (click the bodyboarding and surfing link on the home page). 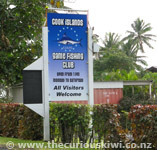 We can't help with fishing questions, however visit www.fishing.net.nz and put Rarotonga in the search box, it will bring up discussions in the forum, some are quite old, but the one that starts Hello All was put up a couple of weeks ago. hi can you fish from the shore in raro? Some resorts will provide equipment for free to paying guests. 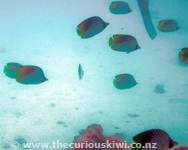 If you're on a tour, snorkelling gear is usually included free of charge. 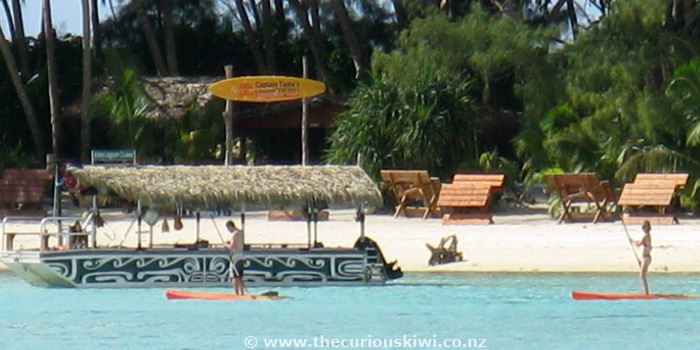 Captain Tama's at Muri Lagoon currently hire paddleboards for $20 per hour. We are coming over for my husbands 60th with our family and grandchildren, is there anywhere we can hire and pay for a small cultural show at the house we are renting? Admin: Hi There is a list of 'Island nights' above, you could email the associated resorts and ask if it's possible to get a small group to do a private show. 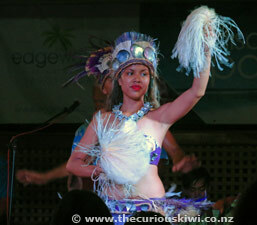 Alternatively, enquire via cookislands.travel and ask if small group cultural shows are an option. 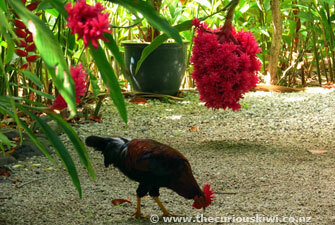 That's a good question, but one we can't answer as we don't live in Rarotonga. 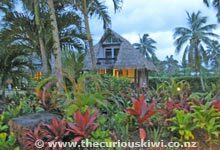 You could contact The Cook Islands on Facebook and ask there or follow the link to the website and send an email - they'll know for sure. Hi Guys, we are coming over for the 2016/17 Christmas season, how does the public holidays affect purchasing, if we land on the 31/12, is it best to do the whole shop for a week then, as it lists the public holidays as the 1,2,3 of Jan, does everything close like nz? Do they rent kids helmets for riding as a passenger / pillion on scooters? As I would like to take her on the scooter with me. She is 4 years old nearly 5. Need to know where to hire the kids helmets from. I have seen kids on scooters when I was last in Raro however they never had helmets. Admin: Hi Sorry for the delay in replying, first up I'd enquire at your accommodation option as they may rent out scooters and helmets or alternatively know of somewhere close by that does. Adventure Cook Islands Dive Center & Rental Shop list helmets for hire, although not specifically for children but it would be worth emailing them to ask (find the email link on the price list page - http://www.adventurecookislands.com/pricelist/ ) or contact other scooter rental options in the Getting Around section. Admin: Thanks for your comments and suggestions. Good question, I'm not sure, but it seems reasonable that they might if you're buying lunch. 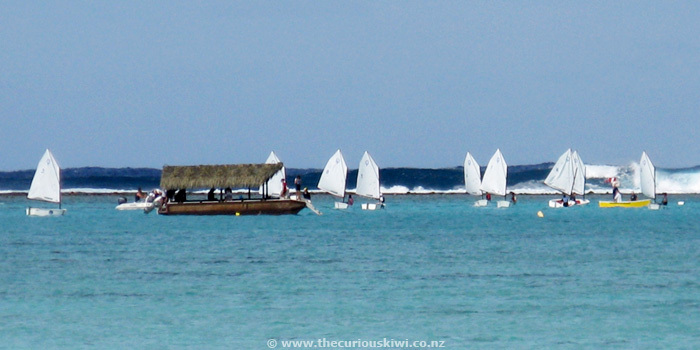 All they can do is say no, and given Raro is a little island it's easy to move on and ask elsewhere. Can you visit hotels and have lunch and a swim? Our accommodation doesn't have a pool. 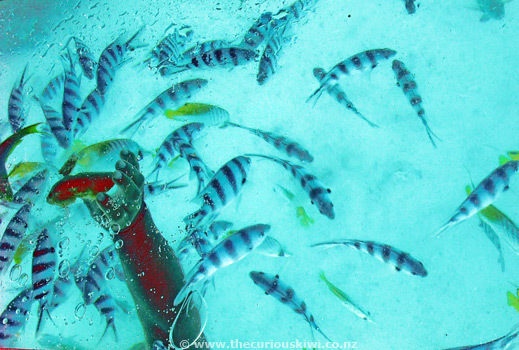 Thanks for your comments, it's good to know Edgewater has superb snorkelling especially given the property's popularity and inclusion in package deals. Thanks Sharleen, I've added a link in the self contained accommodation section. 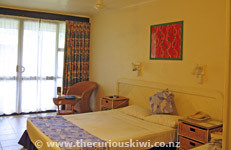 I highly recommend, as a self catered option, the Muri Hillside Guest houses. Amazing hosts, Serena & Conrad Hunter. 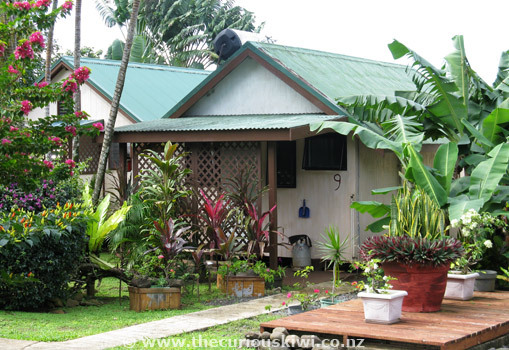 Great affordable price, great family feel (bungalow), beautiful setting. Thank you Ron, your comments are much appreciated (and anyone who writes such nice remarks can spell my name any way they like ;) I'm interested to know how you find Sunset Resort, feel free to comment or email me via Contact Us on your return. Bon Voyage. Sorry for misspelling your name, RACHAEL! Thanks to you, Rachel! This website you've created has provided a plethora of information. You are to be commended! We leave Los Angeles the evening of October 20th for 12 nights at The Sunset Resort. Meitaki! Thanks Ron, good to know. You must be flying away soon - happy travelling in paradise. For those who are not yet aware, the Departure Tax of NZ$55, formerly required to be paid by all departing passengers from the Cook Islands, is now included in airfare tickets, as of 1 December 2012. This I have verified with my travel agent, Costco Travel. 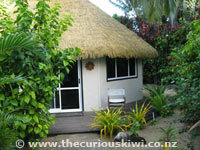 Admin: Thanks for the recommendation Olivia, I've added Coral Sands to the self contained accommodation section. 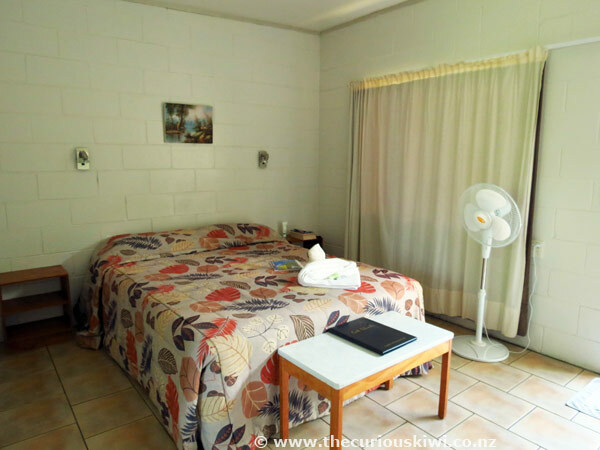 It's a bonus in Rarotonga that there are quite a few self contained options for those who want to self cater, it's good to add another to the list. For anyone's possible interest, we will be in Rarotonga during October 2013 at the Sunset Resort for 12 nights. 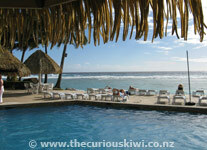 It will be our third visit, the first being in 1997 at the newly reopened Rarotongan Beach Resort. We are so looking forward to our return to paradise, with a repeat day tour over to Aitutaki.